In a bid to improve the online coverage produced by radio reporters at BBC Surrey and BBC Sussex, the stations undertook a 24 hour live broadcast exercise yesterday where journalists were tasked to report from their patch using mobile journalism (mojo) tools. Sara David, managing editor of BBC Surrey and BBC Sussex, sent 15 reporters out in the region with mojo kits, briefed to produce content for the radio and its social media channels. “This is the first time we have covered events in this way, but it was really useful in giving our journalists more confidence when producing this type of content for social media,” said David. Reporters, who were previously taught by mobile journalism trainer Marc Blank-Settle, used a variety of mobile tools and apps to document activities taking place in the area, from taking line dancing classes to witnessing the building of super-cars at McLaren garages. “Along with using broadcasting software Luci to broadcast live remotely, my colleagues and I had iPhones full of apps to test out in the field – it was great to get our hands dirty,” said Peter Stewart, journalist at BBC Surrey. 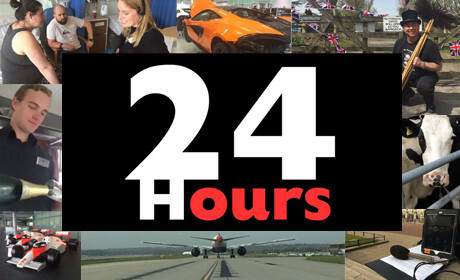 The 24 hour broadcast, which finished at 8am this morning, flagged up a number of challenges that mobile journalists face while reporting and producing content for social media. “On the second part of my shift, I was on a remote rural farm in Surrey, and there was barely a mobile phone signal at all so I had to pre-record interviews, drive up the road and send them to the studio in a 4G area,” said Stewart. The stations hope to continue to build upon the journalists' use of mobile journalism to improve their presence on social media. “It is obviously imperative that we are not just broadcasting on a radio station – we have to be multi-skilled on a multitude of platforms,” said Stewart. “The quality of what we were all able to produce on social media was astounding and it obviously enhanced our coverage on air."